In less than 24 hours, Andy and I will be off to Seattle for the annual National Puzzlers’ League Convention! This convention is one of my most favorite things in the whole world- several days of hanging out with the most brilliant, creative, and kind people, playing amazing and wildly innovative games and solving equally amazing and innovative puzzles. Also! This year a few of us have scored seats at the private table at Salumi, a Seattle eatery specializing in cured meats. Yes. Yes. And it’s owned by Mario Batali’s parents, which is neat! Anyway, a few years ago I met an amazing fellow named Mike Selinker at an NPL Con. Mike (aka Slik) first wowed me with his brilliant homemade Jeopardy game, Slikardy! He’s also the President of Lone Shark Games, which collaborates with Wired on lots of fun puzzle-y projects. To sum up, he is both cool and awesome. Several months ago, dear Mike approached me about turning several of my recipes into crossword puzzles, and I said that sounded totally amazing, and he did it! 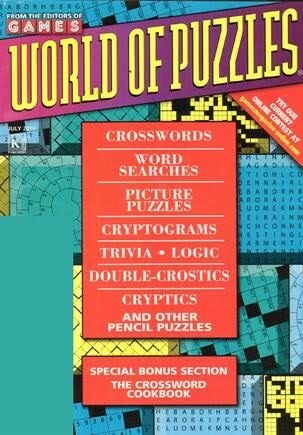 And now you can see these puzzles and my very own recipes in the current issue of Games World of Puzzles magazine! See? It’s even listed on the cover! Mike has taken all the key ingredients out of the recipes, so you’ll have to solve the crossword puzzles to fill in the blanks. I think it’s terrific fun, and I’m so happy to be a part of it! Thank you, Mike! I can’t wait to see you and all our puzzling friends! One more day! I find the pastrami to be the most sensual of all the salted cured meats. Arielle Clementine, you are full of surprises. Have a great time! Can't wait to see you too, darlin'. Thanks for helping me make the tastiest puzzle section of all time.